Right now if you want live streaming of TV news, 24/7, on the Net, here in the U.S., from a major global news organization, you have just two choices: Al Jazeera and France24. Soon you’ll have just one, because Al Jazeera’s stream is going away. That’s because the company will turn its stream off when it fires up its new cable channel, Al Jazeera America, on August 20. Everything I just wrote is a provisional understanding: the best I can do so far. Some or all of it might be wrong. Here’s what I do know for sure. 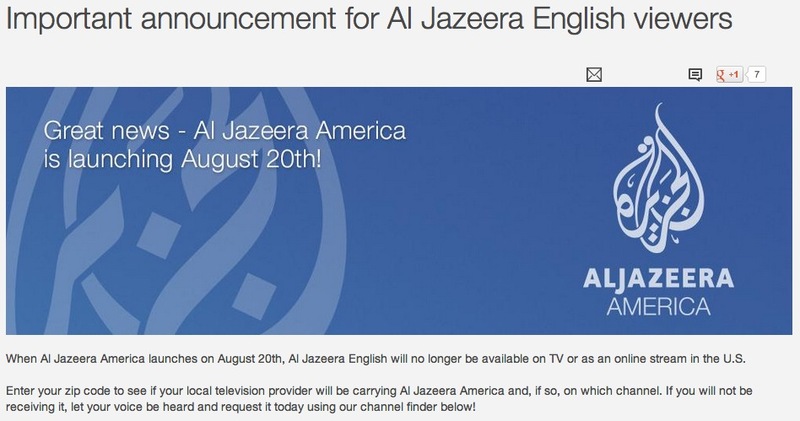 In case you can’t make out the small print, it says “When Al Jazeera America launches on August 20th, Al Jazeera English will no longer be available on TV or as an online stream in the U.S.” That means gone completely, right? Click on “Al Jazeera Mobile Services” and it lists apps for a variety of mobile devices. All talk up “free access to the live stream” (or equivalent copy) as a main feature. Are they just late to removing or qualifying that copy? Or will the live stream be gone only from the website? View our network through the internet via websites, online TV providers and mobile apps. 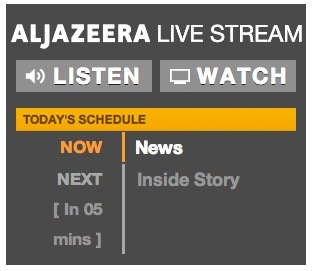 Watching Al Jazeera English via the internet is now easier than ever. The network is broadcast around the world to over 220 million households, but don’t worry if you can’t find us on your television.A range of websites, online TV providers, and mobile apps now offer a live stream of our channel. Browse the list below to discover the best way for you to watch and click the links on the left for specifics. Al Jazeera English Watch the broadcast on our website. Livestation Our UK-based partner streams AJE live. YouTube See our live stream, programmes and news clips. Facebook On the social networking site, stay tuned with AJE. Dailymotion Watch programmes and news clips on AJE’s channel. Samsung Smart TV Watch the live stream and video-on-demand from the app. LG Smart TV Watch the live stream and video-on-demand from the app. Roku In the channel store, access the Newscaster. Google TV See the AJE feed through the Google play app. Boxee Watch AJE on your box through the Livestation app. PlayStation 3 Open up the Livestation AJE feed through your console’s browser. iPhone/iPad/iPod View live news from AJE on Apple devices through the iTunes app. 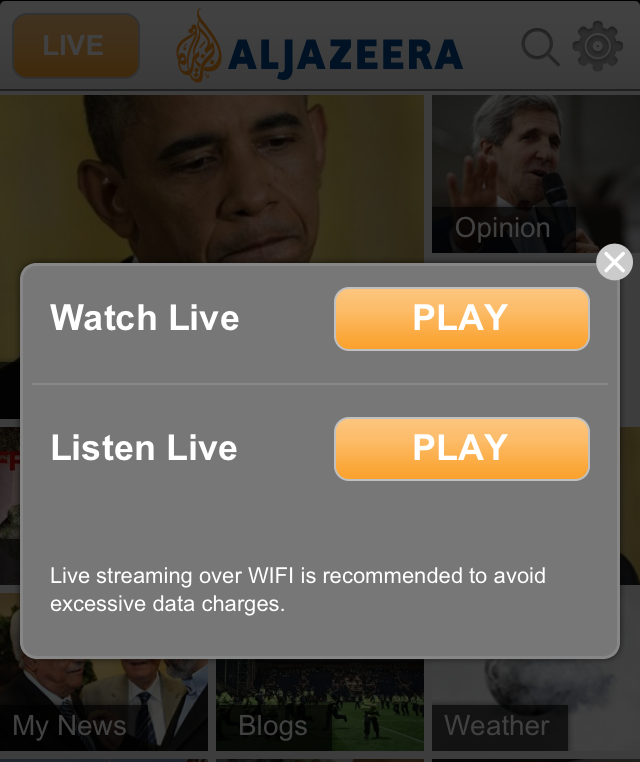 Blackberry Open your internet browswer and watch Al Jazeera live. Android Use our new app to watch AJE on your smart phone. Symbian/Windows Live stream Al Jazeera English on your mobile through Mobiclip. Due to copyright and distribution restrictions, not all viewers will be able to access all of our streaming video services. Are they killing off all of that stuff in the U.S. or just some of it? What exactly are those copyright and distribution restrictions, and how are they involved in this new move? They surely aren’t killing off the live Net streams for no reason, so obviously they were forced to make trade-offs. What were they? Hey, they’re a news organization. What they’re doing by going all-cable with no-Net, is sacrificing the future for the past, seems to me. At the very least they should be transparent about what they’re doing and why . @ajam It says “Al Jazeera English will no longer be available on TV or as an online stream in the U.S.” That mean no phone or tablet too? @dsearls @ajam imho, AJAM will lose credibility if AJE no longer available in US after AJAM launch. @dsearls @ajam The streets will run with the blood of the infidel. Credibility a must for terrorists. RT@mwiik: imho, AJAM will lose credibility if AJE no longer available in US after AJAM launch. @ajam Let me put the Q another way: does AJAM’s debut on cable turn off all AJ streams in the U.S? Or just some? Please be clear. @dsearls Al Jazeera English online videos will not be available in the U.S. You will still be able to read articles on their site. @dsearls Al Jazeera America follows in the same tradition of hard-hitting unbiased journalism so be sure to check us out when we launch. 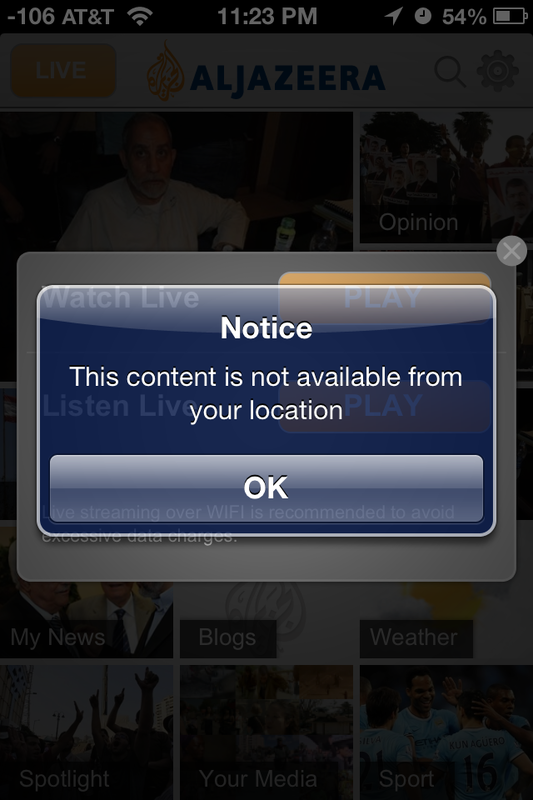 @ajam Does this mean no Al Jazeera streams of any kind in the U.S. except via cable or satellite? @ajam @dsearls Does this similarly apply to their YouTube channel? iOS apps? @ajam Am looking forward to the AJAM launch, but was hoping to still have access to both services. @dsearls One might get the idea @ajam‘s lack of transparency on this first blow on its credibility, even before it launches. I also went to Al Jazeera’s Facebook page and politely asked what was going on. I’d quote what I wrote, but it’s gone. I don’t know why. Maybe they erased it somehow. Or maybe, not being as adept at Facebook as I should be, I just can’t find it. Whatever the story, Al Jazeera isn’t covering it — and, I am guessing, they don’t want it covered. But it is a story. The world’s most ambitious news organization is making a big move on the U.S. news marketplace by subtracting value from what it’s already doing — and none of its competition are doing. Leading edge early adopters. Cord-cutters. That’s the audience Al Jazeera already has online. Advocates. Friends. I was one. See here. Companions. Meaning everything else on the Net that isn’t on cable, such as YouTube. A platform for networked journalism. Cable ain’t it. The Internet is. Predicting that transmission of TV will move to the Internet eventually,Cablevision Systems Corp. Chief Executive James Dolan says “there could come a day” when his company stops offering television service, making broadband its primary offering. But I guess Al Jazeera is a cable channel at heart. And less of a news organization than it aspires to be — or they’d come a lot cleaner about what they’re doing here. And why they’re stiffing their entire online audience in the U.S.
Well, at least we still have France24. [Later…] According to Janko Roettgers in Gigaom, Al Jazeera is not only getting ready to block its English streams in the U.S., but is killing off access to news clips on YouTube as well. The simple reason Al Jazeera is doing it is because that’s the demand from the cable companies in the US. It’s something most media folks were certain would have to happen as far back as in February. It is not a choice Al Jazeera made. 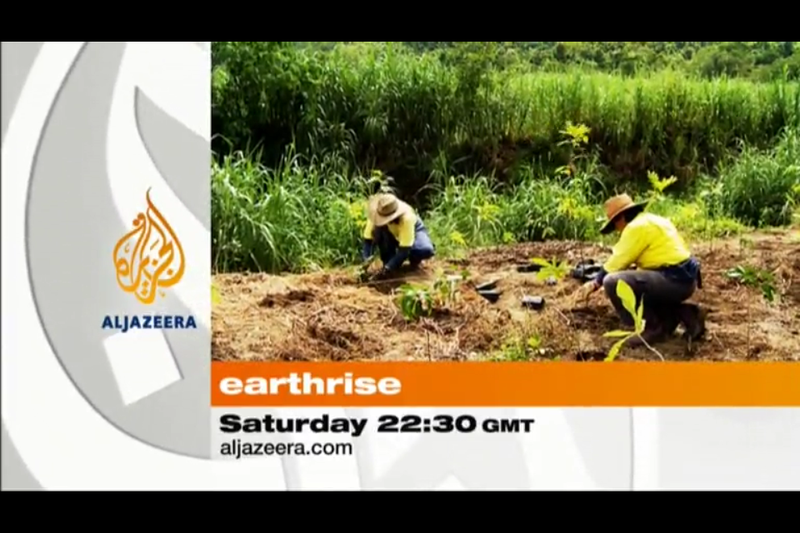 I’m certain those US viewers who wish to watch Al Jazeera English will find it online somehow. True, I’m sure. But it’s a choice they made, and one they should cover. I had same thoughts when (dont laugh) i wanted to watch a show CNN US launched and anchored by John King. As i live in Belgium, i dont have access to CNN US, only CNN International. I had a chat asking the same question: why oh why aren’t you making it available online? Answer: Cable Co’s. Contrats requires exclusivity of some sort. I have also been wondering about this. I subscribe to Livestation’s premium service, which provides AJE, Sky News Int’l, Euronews, and France24 in high quality for $5/month. I’ve emailed their support team asking whether the paid AJE stream will also be going away with the free stream, but they haven’t replied to my emails. Seeing as I’m a paying customer, I think it’s only fair that I should have the option to receive AJE if I’m still willing to pay for it. I have lived in the Middle East, and I can ascertain that Al Jazeera offers some kind of journalist dichotomy in that it is supposed to broadcast in the interest of Arabs themselves yet it has a powerful US/UK background force handling Al Jaezera like a muppet. While linving in the Middle East, I would never turn on the TV and would just go with online news, which, by the way, are monitored in certain ME countries too. Big problem they have there when what’s really going on is hardly shown or is tergiversated to benefit US/UK interests. AJE on Roku’s Newscaster says pay a visit to AJAmerica online to learn more. Damn. One of the only reasons I still use the Roku. Kirk ross, DID you “learn more”? Probably not. AJAM is ignoring this issue.